AGS (NYSE: AGS) (or the "Company"), a leading designer and supplier of electronic gaming machines, table products, and interactive solutions for the gaming industry, will showcase its obsession with providing the best platforms and game titles for online real-money and social gaming at ICE London February 5-7 in Stand N1-536 at ExCel London. Following the Company's June 2018 acquisition of iGaming aggregator and content provider Gameiom Technologies, AGS now offers a robust game aggregation platform, remote gaming server, and a library of more than 600 entertaining game titles from a network of third-party suppliers, and soon to launch, game content from AGS' own in-house studios. To deliver its high-performing games and provide an exceptional play experience, AGS partners with many of the world's leading online operators, including 888 Holdings, Betfred, BetVictor, Coral, GVC Holdings, Ladbrokes, Rank Group, and William Hill. 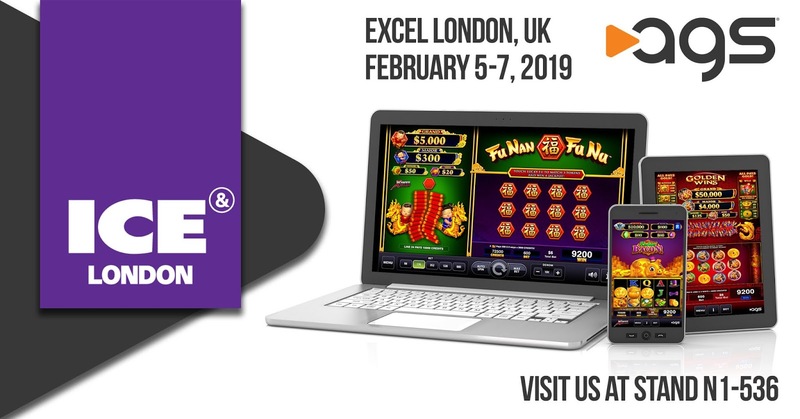 At ICE, AGS will provide live demonstrations of its Axsys Games Marketplace game aggregation platform and game titles soon-to-be available from AGS, which include online versions of AGS' proven land-performers like Golden Wins™Jade Wins™, and Longhorn Jackpots™. AGS will also highlight its large portfolio of game titles from its partner network of third-party suppliers, which include 1x2 gaming, 2 By 2 Gaming, Ainsworth, Asylum Labs, Bulletproof Games, Gaming Realms, High 5 Games, MetaGU, Reflex Gaming, Revolver Gaming, Skillzz Gaming, Storm Gaming Technology, No Limit City, and Oryx Gaming. The Company will showcase its Connexsys Social White-Label Casino solution, a turnkey, free-play B2C mobile app solution for land-based casinos that blends the casino brand with AGS' library of player-favorite games to deliver a mobile gaming experience for players. AGS President and Chief Executive Officer David Lopez said, "We're excited about bringing our obsession for the game to ICE and welcoming online and land-based gaming operators into our stand to experience our player-proven games and our platform technologies for real-money and social gaming. Our AGS Interactive team, along with several of our senior-level executives, will be on hand at ICE to showcase our fast-growing library of high-performing online game content, including our first AGS titles which will soon be available through our Axsys Games Marketplace. We look forward to this launch, given our industry-leading game performance in the land-based market, which gives us confidence that the games will do very well in the real-money gaming space."